Nature conservation is fuelled by urgency. With over 750 Canadian wildlife species at risk, and many habitats being lost and degraded, it’s clear we need to do more conservation in Canada, and we need to do it faster. There are spaces and species across Canada that will be lost forever without action today. With so many urgent needs, it’s absolutely critical that we invest in the right places. For over 40 years, there have been efforts made to identify globally important places for nature conservation. Some of these first designations include UNESCO World Heritage Sites that were identified for their natural features, such as the Northwest Territories’ Nahanni National Park in 1987. The most comprehensive global assessment of important places for conservation has literally been for the birds. Important Bird and Biodiversity Areas (IBAs) have used standard criteria to identify the most critical places for bird conservation around the world. IBAs are categorized as nationally, continentally or globally significant, based on different criteria. In Canada, nearly 600 IBAs have been identified. Key Biodiversity Areas (KBAs) are a new initiative used to identify the most important places around the planet for globally significant species and habitats. Building on the success of IBAs, KBAs are identified nationally, based on standard criteria. These criteria include species that are on the International Union for Conservation of Nature (IUCN) Red List of Threatened Species, significant congregations of species and intact habitats. To date, over 15,000 KBAs have been identified around the world. The vision of KBAs is to identify the global network of the planet’s most important sites for nature. KBAs aren’t parks or protected areas; they are scientifically driven designations. 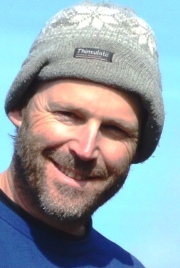 As the world moves closer to the goal of protecting 17 per cent of lands and inland waters by 2020, KBAs can help governments and groups like the Nature Conservancy of Canada (NCC) ensure conservation efforts are being directed towards places of particular importance for biodiversity. They can also be an important reference to inform land use planning by directing development proposals away from the most important sites. In Canada, existing globally and continentally significant IBAs and sites identified by the Alliance for Zero Extinction have been included as KBAs. Currently there are a number of efforts across the country to apply the KBA criteria to identifying other important sites. For the last two years, the IUCN has been identifying KBAs in Canada based on globally rare freshwater species. With input from NatureServe Canada and experts across the country, these sites were recently unveiled in a report entitled Freshwater Key Biodiversity Areas in Canada. The report identifies 13 freshwater KBAs that provide habitat for globally threatened plants and animals, including species that are found nowhere else on Earth. The 13 KBAs occur in BC and Alberta, the Great Lakes–St. Lawrence River region and in Atlantic Canada. In many cases, the KBAs delineate the habitat of species that naturally occur in very small ranges and, as a result, are vulnerable to extinction. Some of these species are endemic to Canada, meaning they cannot be found in any other country. These endemic species include Atlantic whitefish (Nova Scotia), copper redhorse (Quebec), Banff Springs snail (Alberta) and Vancouver lamprey (BC). Other species range into the U.S., but are at risk of extinction because of declining populations and threats to their habitat. For example, the Lower Saint John River in New Brunswick and East Sydenham River in Ontario have species of mussels that are now globally rare because their freshwater habitats have been degraded by water pollution, dams and sedimentation. 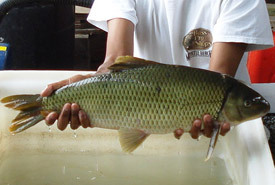 Important conservation actions are already happening in many of these freshwater KBAs. Most of the species are included on Canada’s official list of species at risk and have active recovery actions. The Banff Springs snail is globally rare and is also listed as endangered under Canada’s Species at Risk Act. The global range of this small snail is restricted to just seven interconnected hot springs in Banff National Park. Parks Canada has been researching and implementing recovery efforts to save this species, including re-establishing populations. 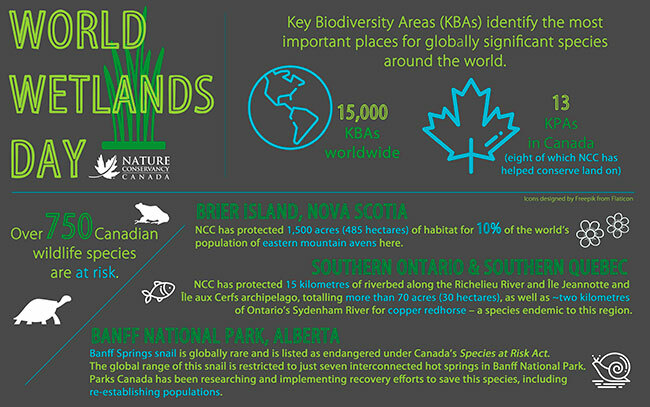 NCC has been working with conservation partners in eight of the 13 freshwater KBAS. 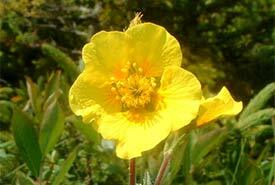 On Brier Island in Nova Scotia, NCC is protecting and restoring wetland habitats that support more than 10 per cent of the world’s population of eastern mountain avens, a globally rare plant with yellow flowers. Eastern mountains avens can only be found in New Hampshire and Nova Scotia, and the Canadian population is threatened by alterations to water levels and invasive species. Protecting threatened freshwater fishes can be more challenging than plants or snails that live in very small and discrete areas. In some cases direct habitat protection can occur. In 2002, NCC helped establish a refuge in Quebec to protect the copper redhorse, a large fish that can only be found in Canada. 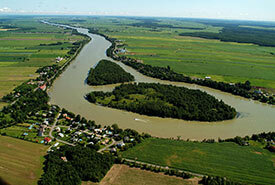 NCC owns a 15-kilometre section of the river bed upstream of the Pierre-Étienne-Fortin wildlife refuge (named after the naturalist who first described the copper redhorse). In southern Ontario’s Sydenham River, NCC recently supported the protection of almost two kilometres along the river by our partner Ontario Nature, through Environment and Climate Change Canada’s Natural Areas Conservation Program. For many freshwater species, the most important conservation actions we need to take will not happen in the water, but on the land. Conservation in watersheds and along rivers and lakeshores can help reduce many of the threats to freshwater ecosystems, including sedimentation and pollution that runs off from our cities and farms. We need to get freshwater conservation right. Not only is it critical for nature, but clean, secure fresh water is critical for people. Protecting the Richelieu River ecosystem is important for the copper redhorse, but it’s also important for over 30,000 people who get their drinking water from the river. In most places in Canada and around the world, we have not developed and implemented protected areas systems that effectively conserve freshwater habitats. Many of the protected areas we have established conserve important freshwater areas by chance, and not by choice. While there are many examples of watershed plans and planning efforts, such as the Freshwater Blueprint for Maritime Canada, freshwater KBAs will be an important resource to help direct conservation efforts to priority areas. In addition to supporting conservation efforts and helping to inform land use decisions, KBAs can also help raise awareness about places of global significance that may be in our own backyard. They provide a pedigree of global significance that can be used to highlight their conservation importance. Protecting these places is important not just for Canada, but for planetary efforts to save nature. Restoration is super cool... literally!